Light of Day Daisies and Hydrangeas is a new work in the studio, as I prepare paintings for a couple of upcoming shows. 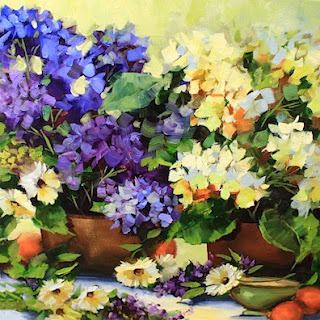 Today was the day when the larkspur, sunflowers, and two of the hydrangeas and all the red daisies said their farewells, after contributing all they had to the studio for almost a week. It's been an eventful week, and for those of you who saw the photos of the Chihuly glass tour I shared here on the blog Monday, a hail storm hit the Dallas Arboretum yesterday evening around 4:30 pm and damaged some of the glass in the exhibit. Fortunately, only one piece was badly damaged, at least that is the last report I heard. The hail storm came through very suddenly and drivers who were on the highway had their windshields broken out in some cases by baseball sized pieces of ice. I remember when I was in my 20s standing under a metal awning during a hail storm like this one, and watching softball sized hail almost punch holes in the metal roof of my carport. Texas storms can be so damaging, but fortunately they come through very quickly and seem to be gone before you know it. I'm very glad my little pugs were indoors safe and sound! That is such a shame that the hail storm broke some of Chihuly's work. As you mentioned, he has a replacement, I know. Still...such a waste!